Hallo! It's been a few days since I last wrote. Things have been busy! This is a Red Forest Jewel Cichlid. 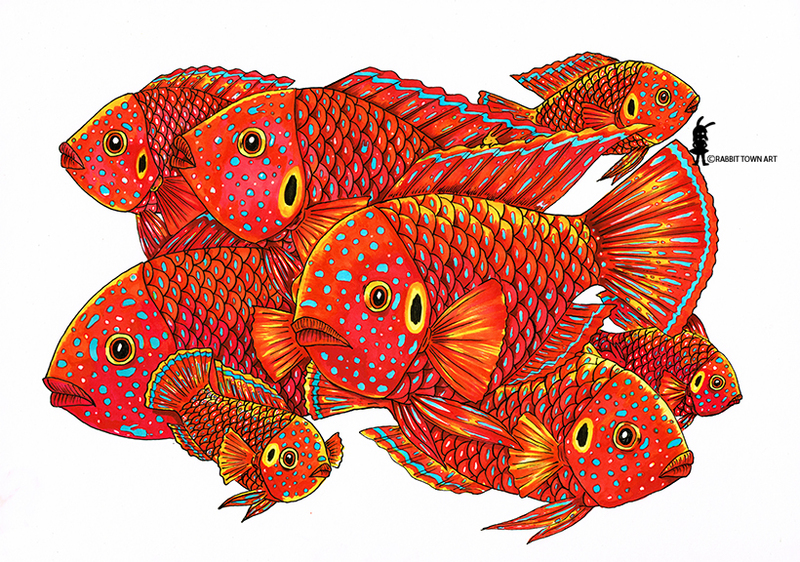 I do love drawing fish. There are bunnies hidden, can you find them all? Colored with markers and inked with indian ink and a dip pen. What's been happening....I misplaced Rob's passport in 2015 and we spent 3 nights looking for it and we found it in a bag full of old Japanese pamphlets in his study cabinet. What a relief, I was super duper stress. I was suppose to put it in a safe box, but since I just recently moved in I made a mistake. Oh well, all is good now! I never want that to happen again though. It was not a pleasant experience. I was finally paid for a job that I finished ages ago, I picked up another e-book job and I might be booked all of July, shortly after my current contract ends in June. Then I'll probably be contracted for a series job in August. Busy, busy! There's so much stuff happening this year. Rob and I are also sorting flights for a trip we're taking later in the year and I need to sort out our itinerary. I have also started drawing my lucky cat collection. I've drawn 7 so far. I'll post them here in the coming days. That said, because I haven't been posting regularly, I actually have a backlogged of drawings to put up. Sorry, some days I just don't want to talk about stuff. What's on in the next few days: I have to do some work after hours for the e-book job, a friend of mine is visiting from Canada and is staying over for a night this coming week, I have a BBQ tomorrow and studio works. Lots of it. I am really enjoying the job. I've been doing character design and turn-arounds as well as coloring. It's definitely a lot of fun and I am enjoying myself! I can't wait to announce the project! Sadly, until it's released, I can't really say much.